Matthew 13:45-46 – “Again, the kingdom of heaven is like unto a merchant man, seeking goodly pearls: Who, when he had found one pearl of great price, went and sold all that he had, and bought it”. Pearl jewelry has always been a classic throughout history because it showcases style, sophistication, elegance and delicateness to the woman wearing them. Pearls suit a wide range of different outfits and occasions, and are always a well-loved item throughout the ages. Whether you enjoy collecting classic, vintage rings or jewelry items, or am unsure of what to buy for your loved one, pearls are always a must-have and go-to for exactly these reasons! Here at Apples of Gold Jewelry, we have 4 different goodly pearl styles that will suit your exact wants and needs! So let’s take a look at some of our pearl collection! Wanting to add to your chain collection? 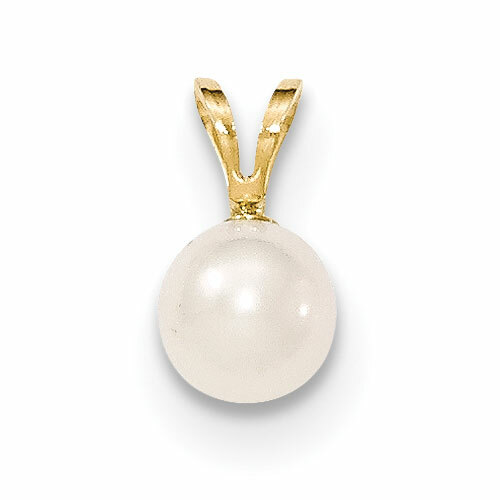 This gorgeous akoya pearl pendant is perfect for exacrly that! It is in 14K of gold and measures approximately 6-7mm of genuine pearl (shown right). If your heart sings elegance, then look no further! This stunning south sea pearl and diamond synphony pendant provides a beautifully unique design, without needing to go over the top in looks. This is such a romantic piece to get for that special someone, who you love to the ends of the sea and back! Want to be more romantic? Or have a passion for diamonds and sophisticated style? These diamond infused pearl pendants are your perfect match! A love for diamonds and a desire for goodly pearls, this heart shape white freshwater pearl and diamond pendant is the answer! This amazing 18K white gold heart pearl pendant has a gorgeous AAAA quality freshwater pearl, surrounded by 28 sparkling diamonds. So very romantic! Another romantic classic design is this freshwater cultured pearl and diamond necklace too. There is a 6-7mm freshwater pearl set admist an array od 0.05 carats of white diamonds. Such a beautiful piece for a beautiful woman! 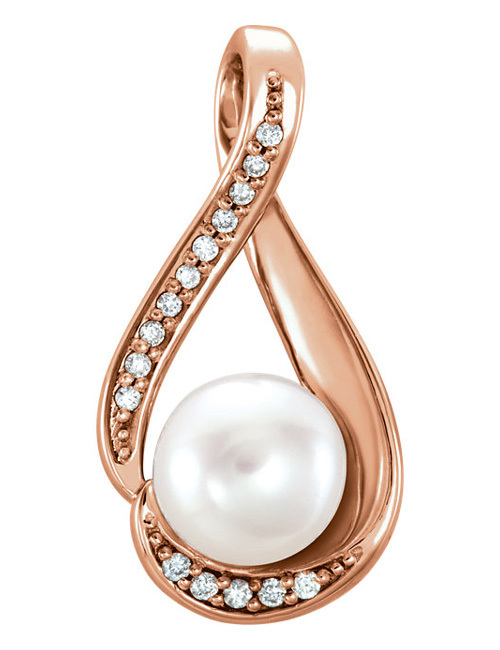 For those who adore rose gold, this 14K rose gold freshwater pearl pendant is just what you need! Showcasing 0.05 carats of full quality white diamonds amongst the slide-style pendant, and a genuine freshwater cultured pearl in the centre, you cannot go wrong with this gorgeous and genuine design! Prefer gold instead? Apples of Gold Jewelry also has pearl pendants in gold! For instance, this golden pearl dangling diamond pendant is an elegant design featuring 7 diamonds and 14K of gold. Another featured gold style pearl pendant design from Apples of Gold is the fleur de lis freshwater pearl pendant. Made from 14K of gold, and featuring a classic vintage style to the pendant, this is the perfect gift for those who truly love traditional jewelry styles, without losing the graceful appearance. Another goodly pearl style is pearl rings! 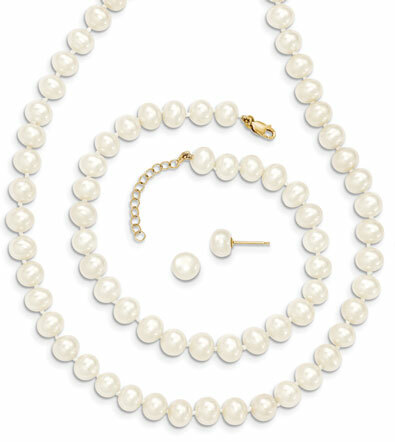 Enjoy classic Australian pearls, without going the distance! This heart-shape Australian pearl and diamond ring from Apples of Gold has a gorgeous design featuring two hearts made from 22 authentic diamonds surrounding a gorgeous south sea pearl, all in 14K of white gold! Here’s an idea! 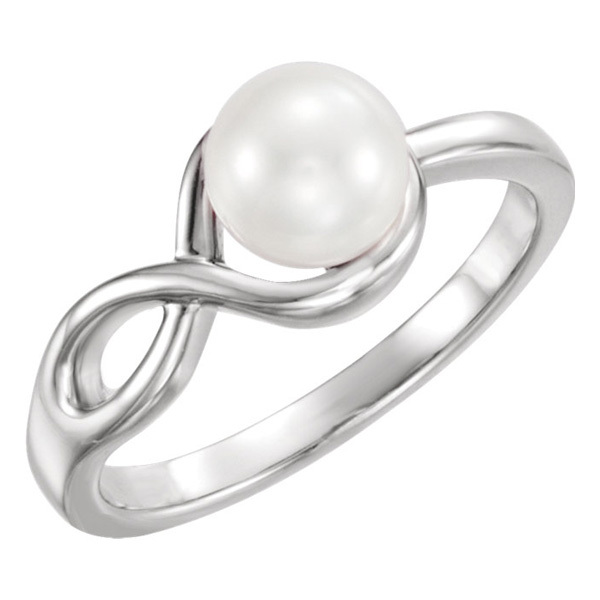 What a better way to say I love you forever then with this amazing infinity freshwater pearl ring. Showcasing an infinity symbol crafted in 14K white gold, with a genuine, high quality freshwater pearl in the centre, this ring is a definite piece you will want to buy for that special lady in your life! Don’t forget, pearls don’t always come in as a white, glossy gem! Apples of Gold have stunning black pearl ring designs too! Take a look at this tahitian pearl and diamond sea breeze ring! Featuring an exquisite Tahitian pearl from the south sea, and 6 large diamonds, as well as over 1/3 carats of sparkling diamonds, this pearl ring is a gorgeous piece representing what the south sea truly has to offer! Show the woman of your dreams this ring, and let her know you want to spend eternity loving her! The tahitian pearl and diamond eternity ring is an elegant piece which has a high quality black tahitian pearl in the centre, surrounded by various diamonds in several different loops. For something a little different, this black akoya pearl and diamond swirl ring is something to draw your attention to. The ring is adorned with 0.26 carats of diamonds that create a swirl design, capturing the attention of one and all, locking you in to the beautiful black akoya pearl in the centre. This ring can come in 10, 14 or 18K white gold, with the option of 14K yellow gold too. Pearl jewelry doesn’t just have to be for that special someone in your life; pearls can be given to any loved one, such as a mother, sister, aunt or grandmother for instance. There are three different beautiful, unique pearl earring designs to choose from at Apples of Gold. 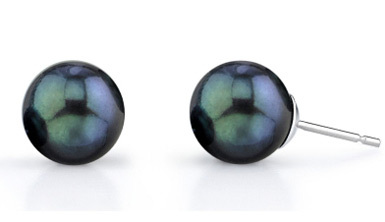 Add a bit of sparkle to your wardrobe with these exquisite 10mm cultured pearl dangling diamond earrings! With 7 sparkling diamonds and pearls with superior grade mirror lust put together in 18K of white gold, you cannot go wrong! Gaze your eyes upon these gorgeous golden south sea pearl and diamond julia dangling earrings! Made from 18K of gold, romantic shaped diamonds and super grade luster pearls, this is the perfect gift for your wife! Simple, yet sophisticated is exactly what these dangling earrings portray! A beautiful pair of pearls from the south sea on golden chains, these golden pearl dangling tincup earrings suit any style, any ocassion and any one! Have a daughter graduating from high school or college? Perhaps a work colleague, or friend has a birthday coming up? Can’t think of the perfect gift for that special anniversary with your partner coming up? Apples of Gold has the perfect gift for those occassions you can’t seem to find the right gift for! Elegant design, and easy to wear, these freshwater cultured pearl hoop earrings are your answer! These earrings are in 14K of yellow gold and have three pearls on eacn hoop. Pearls look amazing on bracelets, as well as on rings, earrings and as pendants! Apples of Gold have many different pearl bracelets to suit your exact needs! Looking for something simple and won’t break the bank? This beautiful single strand freshwater pearl bracelet is the answer you’ve been looking for! This bracelet has 22 pearls and are approximately 8-9mm each in size. If you want something more bold and colorful, Apples of Gold also have this multicolor freshwater pearl bracelet! The pearls are 7-8mm in size and are of AAAA quality. If you know someone who adores pearls, this triple-strand freshwater cultured pearl bracelet is both affordable and stylish! The bracelet has 63 pearls that are 8-9mm in size and comes in silver, which will suit any outfit and attire! For something a little different, but is still trendy and gorgeous in design, this freshwater keshi pearl bracelet is amazing! The bracelet is in .925 sterling silver and has several keshi pearls that are 8-9mm in size. Set your eyes on this delightful heart and freshwater friendship pearl bracelet. It is the perfect gift for your friend that has a heart-warming feel to its design. The bracelet has cute hearts in sterling silver, with freshwater pearls that are separated by beaded spacers and silver heart spacers (shown above/right). Overall, there are sooooo many different gorgeous pearl designs that you can buy from Apples of Gold jewelry! We have different items that will suit your individual tastes, wants and needs! You can never go wrong with adding pearl jewelry to your attire, or buying pearls for that special someone in your life; whether it is a friend, work colleague, family member, or wife, Apples of Gold are the answer to your jewelry desires!